preparation: Fry for one minute in olive oil, mix the boiled pasta (preferably spaghetti), stir well and enjoy. Caution should be given to the dosage, the peperoncino holds what he promises! our suggestion Particularly suitable for refining dishes, where taste and spicy are required. Add salt to your taste. ingredients: Salt, garlic, chili, parsley, chervil. contained allergens: May contain traces of mustard and celery as well as sulphites. 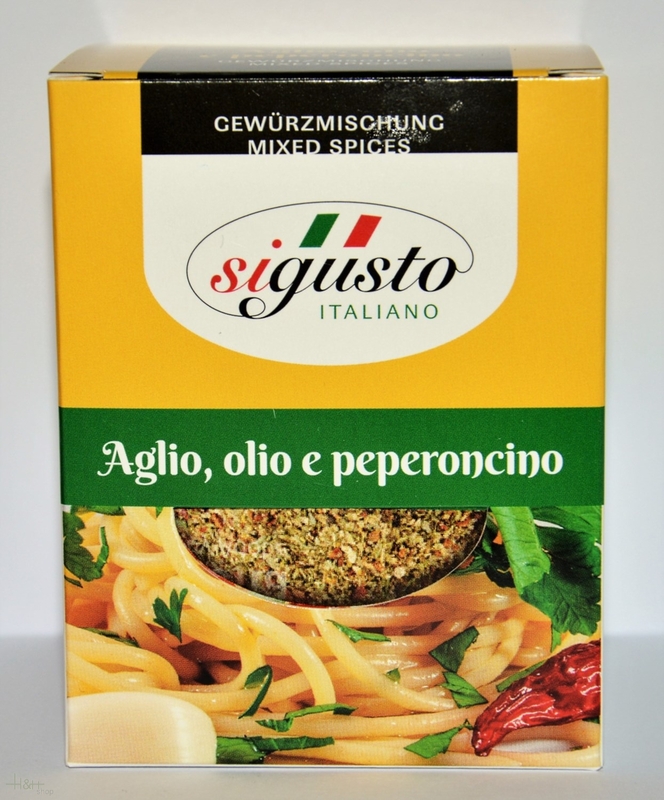 average nutritional values per 100 g: Calories: 1262 kJ (299 kcal); fat: 3,7 g; saturated fat: 0,7 g; carbohydrate: 48 g; sugar: 3 g; protein: 13 g; salt 26,6 g.
SET Mixed Herbs Sigusto Caprese - Piccante - Degu-Box Pizza/Bruschetta - Sugo/Insalata 180 gr. 7,95 EUR / 4,42 €/100 gr.